This peculiar ruin, a well known landmark, is on the road between Castledermot and Baltinglass. Its unusual because its so tall, possibly 3 storeys with 2 tall chimney stacks, and for an 18th century farm house this is unusual. For such an enduring structure I don’t when, or why, it was abandoned. Possibly as a result of a fire, or maybe several fires, as the roof was probably thatched. I decided to set the scene with a dramatic morning sky. This was not what it was like when I photographed the scene. That day there was a drizzling fog and not at all in keeping with what I had remembered it like the last time I passed this way. On that occasion it was a clear bright morning and what a sight was presented as I rounded the corner and was confronted by this ghostly shell of a house. I used 3 simple colours here, Yellow Ochre, Burnt Sienna and Prussian Blue. I knew the green produced by this yellow and blue would be just right for this early morning light. Green always produces problems if painted as a monotonous layer as it tends to dominate a painting. I made sure to have as many colours as possible underneath the green before finally laying it down. Some of the under colour mixed with the green and in other places I didn’t completely cover the under layer. As there are only 3 colours used and the same yellow and blue were also used in the sky, there is a green tinge in the sky. This is not too noticeable as a green colour, as the solid version of this green is so close by on the middle distance ground. What is noticeable is the harmony between the sky and ground colours. A distinct advantage of a limited palette. 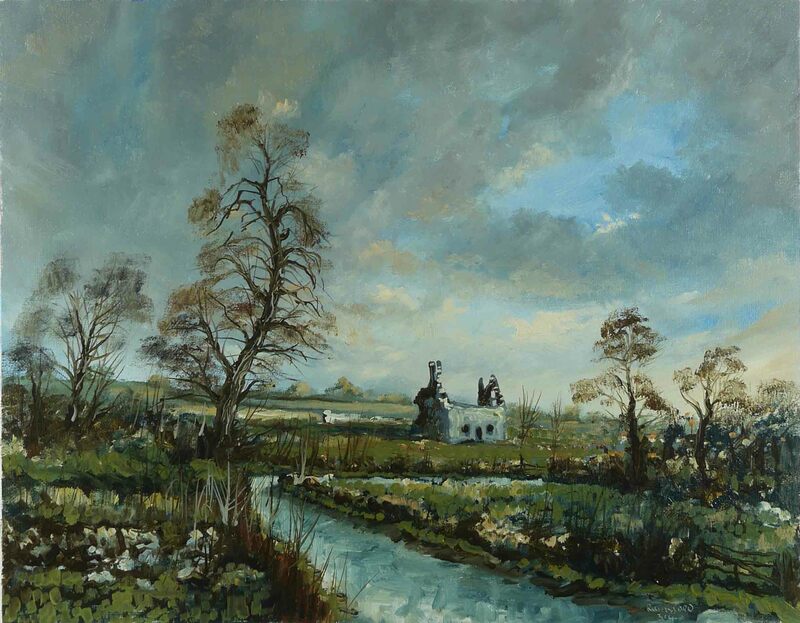 This entry was posted in Oil Painting and tagged Art, Culture, Education, Inspiration, Irish landscape, Oil Painting, Oil Painting Instruction, Sky, Trees. Bookmark the permalink.